Disappointed with offshore BASIS support models? Quality, time zone, and communication issues are just the start when it comes to some of the frustration and delays organizations experience. Bayforce provides a better way. Bayforce has reimagined how to deliver a comprehensive BASIS services model with U.S. based expert level consultants at an impressive value. Not only will we keep your SAP systems up and running smoothly, but our team will also assist you in road map planning for future migrations to HANA, system conversions to S/4HANA, or expanding your SAP foot print on premise or in the cloud. In the coming years, you will be faced with many decisions as SAP current releases reach the end of their lifecycle and migration to S/4HANA continues. Your SAP BASIS needs will include both the support of your existing systems, as well as the planning, design and build of the systems that will replace them. Partner with Bayforce and we will keep your current systems running strong, while helping you to plan and migrate to the new generation of SAP systems. As a certified SAP services partner with over two decades of experience and success, we are a partner you can count on. 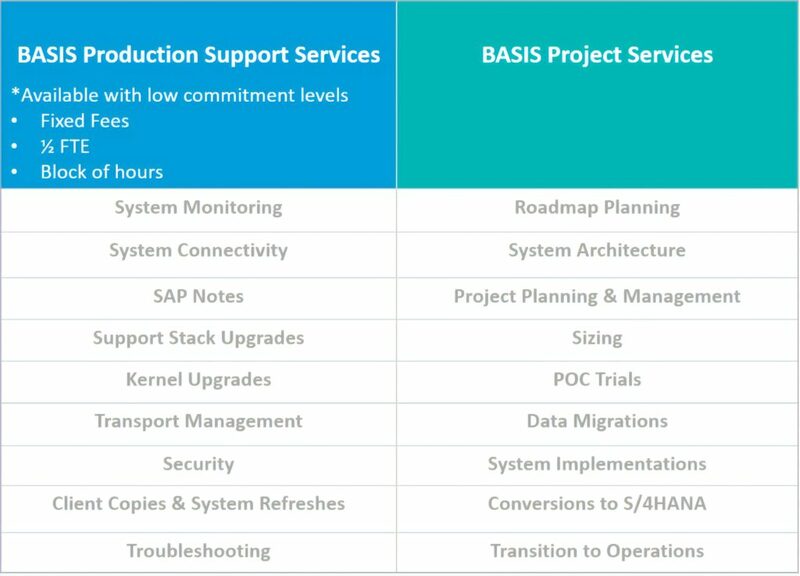 Bayforce can offer customized BASIS solutions to meet your organization’s needs, whether production support, projects, or both. Whether providing you with complete teams, or individual experts to supplement your own team, for either temporary projects & initiatives, or long-term support, on-site or remote, Bayforce will work with you to create a solution that fits your budget.